A bright windy day. Sailing to Conniborrow, reach across to Fahan back down to the start and around Leonards mark. X2. James and Alan established a good lead in race 1 and sailed very well. Bill and James sailed very well in race 2 closely followed by Ken and Davy L. Great to see George G out in race 2 in his Solo. Many thanks to OD Peter F and rescue cover Liam H. Without them we cannot sail, their work is greatly appreciated. A fine day, with a good breeze. Sailing down the river to Conniborrow and Fahan. Aidan O D LFYC handicap has been adjusted to 1165. Ken L slipped in the boat and took a knock but still managed a very good place in race two. Race two had to be restarted as Bill and James J (I quote from the ODs notes) “went arseways around the marks”. A considerable technical achievement in a sailing boat – when you think about it! Commodore James P H and Alan T are sailing very well. Series A will be closely contested! A special baby shower event was taking place in Maureen L’s house at the same time as the racing. The hospitality was excellent and the event went very well. An early start with a 9.00am gun. 7 boats. Nice to see Owen McC in a Phantom and going well. A few adjustments to the LFYC handicap have been made. GP14s sailing on PY have been lowered from 1133 to 1130 in line with RYA recommendations. Aidan O D and Anton Hs Lasers have been reduced from 1185 to 1170 reflecting recent performances. Great to see George G back again for another year of sailing and going well in the Solo. Anton H who got a nice new Laser sail. Owen McC had a first sail in a phantom. Bill and James J launched their new GP14. Good luck guys, the boat looks great. Ken Louden launched the first year of his 7th decade, congratulations to him, he is an advert for the health benefits of GP14 sailing! Two great races were held in fine conditions. F3. Sailing in Culmore bay. A mark was laid over by the docks. A big tide was the reason for the early start and it showed in the second race. Getting around the mark at Harts proved to be a tricky task. Aidan O D came across the fleet on starboard in race one at the start of the race and held onto the lead throughout the race. James P H and Alan T showing fine form with a good win in Race 2. many thanks to Peter F as OD and Liam H as rescue cover. Thanks also to James P H whose fishing boat was used as the rescue boat until the LFYC boat is recovered from its winter storage. Second race started into a squall. James and Alan got line honours who are sailing very well, closely followed by Aidan O D. All boats finished very close to each other in both races. James P/Alan T tried out a new fixed blade rudder and Anton H tried out a new sail. LFYC handicap was rolled over from last year with GP14s sailing on PY of 1133 and Anton H and Aidan O D lasers sailing at 1180. Many thanks to Big Pete as OD and Liam H as rescue skipper. 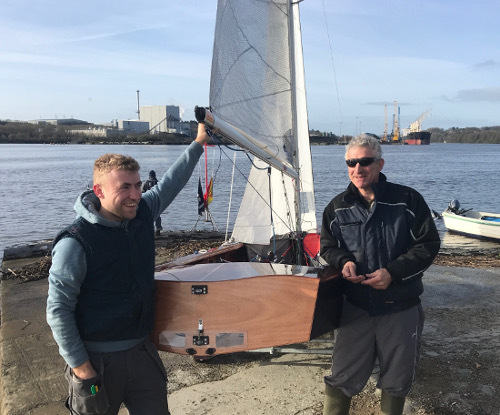 You are currently browsing the Lough Foyle Yacht Club weblog archives for March, 2019.